Would you like to find out how healthy your relationship is? 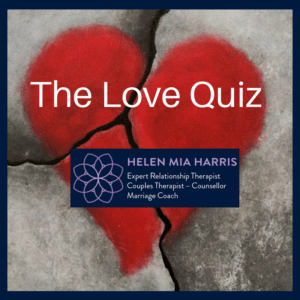 My 5 minute Love Quiz will tell you if you are a love addict and if so, what to do about it. Select Yes for any of the following statements which you can relate to. Do you start to panic if a new potential partner does not call, text, or email immediately after the first meeting? Do you feel anxious in a relationship for fear of abandonment and rejection? Do you avoid relationships at all costs for fear of becoming too vulnerable and loving too much? Intrusive Thinking - you can't stop daydreaming about the beloved reflecting 'only' on the romantic, happy times, no matter how painful it might be in reality. If you don't hear from a new partner for a day, do you worry that they're not interested? Do you find yourself "obsessively" changing your appearance to one you "think" your partner likes, in order for him or her to like/want you more? When you begin seeing someone, do you quickly give up your own routine, interests and social life and adopt theirs? If so, is there a consuming preoccupation of "thinking" about the significant other as if you can’t get them out of your mind? Do you become distressed, worried or anxious when separated from your partner and unable to make contact by phone, email or text? Does the distress and anxiety ease when contact with the partner has been made? Do you experience negative thoughts, erratic, agitated behaviour, or suspicious thoughts if your partner is late home or out of contact? Do you feel a sense of worthlessness and emptiness if you are not in a relationship? Do you confuse sexual attraction and desire with love? Do you find yourself checking mobile devices, emails etc., because you fear your partner isn’t being honest with you? Do you adapt an outer facade of "appearing to be confident and composed" to conceal internal fragmentation? Do you ever try to "mask" how strongly you feel about your partner by acting casually or aloof, in the hope that they will respond positively and reciprocate your love? Do you have a compulsive need to be in a relationship to make make you feel whole and complete? Do you ever fear that your partner will not come home again, despite having no prior argument or dispute? Do you have a driven frantic need to know that your partner feels exactly the same intensity as you do? Do you have an intense desire to know that you are loved and wanted even though your relationship is emotionally secure? Are you ever reluctant to go to sleep - or are unable to do so - without being near your partner, hearing from them, or being reassured of their commitment to the relationship?